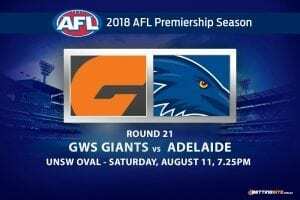 Thursday night’s match between the Adelaide Crows and Geelong Cats at Adelaide Oval will be one to watch this round. The Crows are out of finals contention according to most experts, including ourselves, but that doesn’t mean they will cease fire when they come up against the Cats. After embarrassingly letting the four points slip through their fingers against the Bulldogs, the Cats are slowly clawing their way back into the top four. Getting there will not be easy, they will need to win most of their remaining matches in the last seven rounds of the year. In last week’s round, the Cats played in a very close match, one that was fought out against the Sydney Swans, who at the time sat much higher on the ladder, after Geelong won the Swans dropped to fifth position and the Cats rose to seventh. Tim Kelly proved that the AFL needs to create an award to acknowledge the best new talent in the league. As the match progressed, Kelly stepped up time and time again, eventually kicking the sealer for the Cats. As he is ineligible for the Rising Star, he will not be awarded anything for his amazing first year in the system. The Crows were not a massive disaster, but they did disappoint their fans. Not been able to get within seven goals of a team they had beaten earlier in the year, proves that they are far from their best. Can the Crows reignite their season, or will Chris Scott’s men be too good for them. Here are our tips for this Thursday night battle. Paul Seedsman has turned his football career on its head after finding a place in the Crow’s best 22 due to an ACL to Brodie Smith. Last week in the loss to the Tigers, not many players could have held their heads high, but Paul played a great game and was a stand-out in our eyes. Seed was able to collect 18 disposals on the wing for the Crows, a good performance considering how often he was used. If the Crows link up with Seedsman more often in this week’s match, it will be easy for Paul to get 20 disposals. The odds are very high and we like our chances. Kelly did the unthinkable a fortnight ago when he had 19 touches in the last quarter in round, finishing his night with 34 disposals in total. If Tim can emulate a similar performance when the Cats take on the Crows, we think he will easily get over 25. We know he is capable, so with odds this high, we just couldn’t resist. Adelaide Oval, full home crowd all cheering for the Crows. 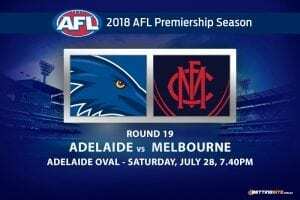 With such massive support in the beginning of the match, the Crows should be able to get off to a good start and be the first side to score 15 points. 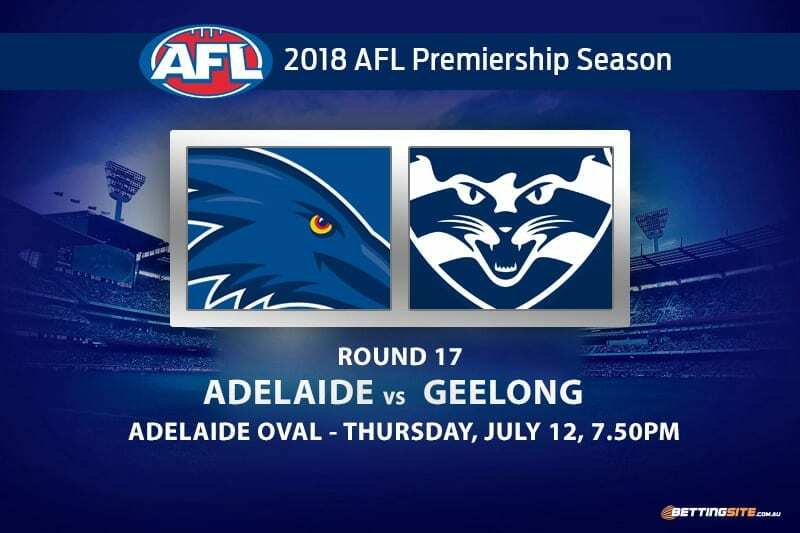 Geelong play a good brand of football, but we think the smart ball-use Adelaide possess will be able to match the talent the Cats have. 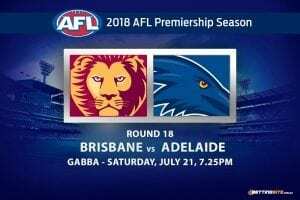 Gary Ablett Jr often enjoys easing into his matches, coming off the bench on some occasions, if he is on the bench this week, you can be sure the Crows will start better. If you did not see the match last week, you missed one of the worst kicking in the modern era. The Cats finished the match kicking eight goals and a massive 23 behinds. We know that they would have worked on goal-kicking all week at training, but it doesn’t go from bad to good in just one week. The Cats will be wayward for the second week in a row, being the first team to tally six behinds. If Tom Hawkins doesn’t fix his kicking, it will be more than just him that suffers, so will his team. Geelong has a very good and well drilled backline, especially considering most of the starting six are not from a football background. Before the last fortnight of footy, the Cats were by far the best defensive team throughout the land, but after conceding a big total against the Bulldogs, the defence has lost their reputation of being amazing, but we still think they are a terrific outfit. 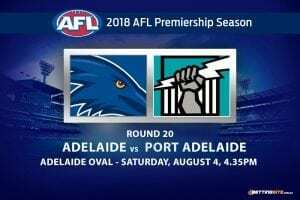 Adelaide has also played a more defensive brand since its great 2017 season. The match will be a war of attrition, a long and low scoring affair. 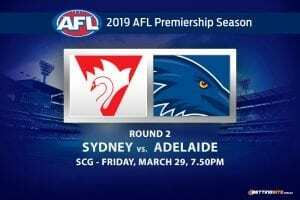 If the Cats were able to beat the Swans at the SCG, we think they can knock off the Crows, even if it is at Adelaide Oval. Patrick Dangerfield will play an influential match in front of his old fans this Thursday.